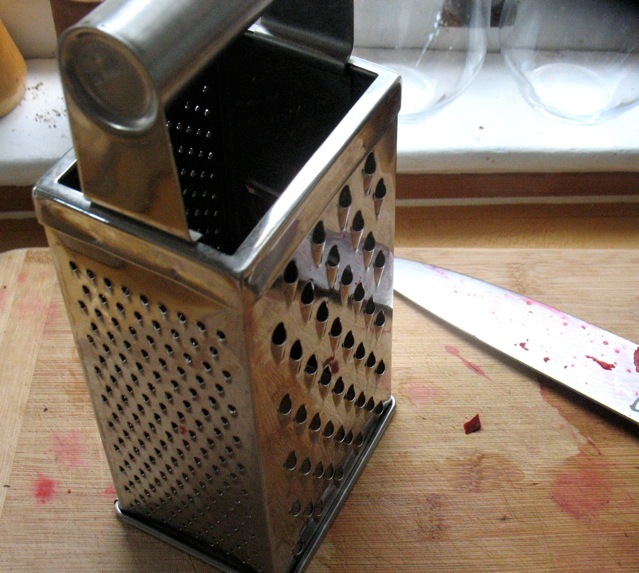 I use my box grater most days. 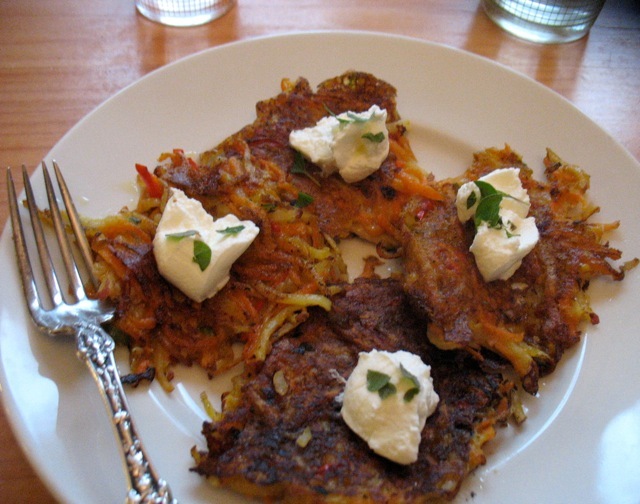 I’ve been grating carrots and rutabagas and making “latkes” with them. I’ve been grating beets and turnips and carrots and making a salad with toasted sesame seeds and a lemony dressing. I’ve been making celery root remoulade the classic French salad of grated raw celery root with a creamy mustardy dressing (though I use Greek yogurt instead of mayonnaise). I’ve been making delicata squash pancakes and grated sweet potato and regular potato and parsnip pancakes. Turnips, sweet potatoes, celery root and carrots, the latter pulled from my garden this morning. . . These were the roots I happened to have around today but so many others--parsnips, rutabagas, beets, potatoes, winter squash--lend themselves to grating. I love my food processor and its coarse grating blade too but I’ve reached for the good old box grater more often lately. It’s easy to clean, lives in a central drawer and requires no moving, assembling, or non-human power. And tools aside, these grated concoctions are winners. There’s no better way to enjoy (or get unfamiliar veggies into skeptical tummies small and large) than grating them, mixing them with a light batter and pan-frying them into crisp, spidery pancakes. Nor is there a better way to put a wintry salad on the table since the grating softens the veggies and enables them to soak up zippy dressings with lots of herbs and acidity. In addition to writing about box graters and root veggies I had planned to write some sort of New Year’s greeting, but this morning I read this post and have been thinking about it ever since. I hope you enjoy it as much as I did. And I’ll just say what a pleasure it is to cook with the beautiful produce our fabulous farmers grow and that I hope to increase access and knowledge and comfort with it, both with new and familiar folks in 2012. And finally, there are lots of new classes posted, including another round of the Eat Better Series, which is a great way to start the new year. So if you received a gift certificate for a class or have been wanting to take one or would like a “tune up” I’d love to see you here. I shouldn't really call these latkes since they have cream or milk in the batter but they are worth trying with most any root veggie you have on hand. I referenced this recipe last week and received quite a few questions asking for more details and a real recipe so here you go. This is more of an idea/technique than a recipe and it’s not an authentic latke. Be that as it may it’s a great, great way to enjoy winter (especially root) veggies. 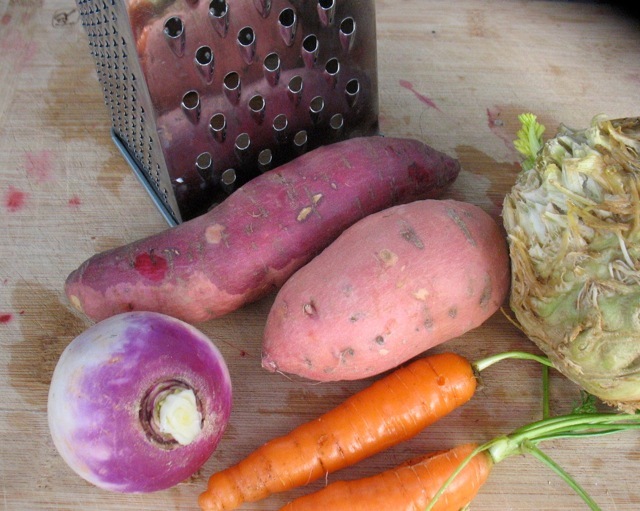 You can also include or substitute turnips, celery root, sweet potatoes or potatoes. The quantities listed are approximations and can be adjusted based on what you have on hand, your taste, etc. For the below recipe you want about six cups of packed, grated veggie. Let the grated veggies rest, sprinkled with a little salt, in a large bowl while you prepare the batter. In a smallish bowl whisk the eggs with the flour and cream, salt and pepper. Squeeze out any excess liquid from the veggies with your hands, a big handful at a time. Return to the bowl; add the onion and herbs and finally the batter. Mix well. Taste for seasoning before you start frying. Under salted latkes are no fun. Heat a large skillet over medium-high heat with a tablespoon or so of olive oil. Scoop large spoonfuls of the mixture into the hot pan. Flatten each one a bit with a spatula. Leave them alone for a few minutes until the sides start getting crispy and golden. Flip carefully and continue cooking until both sides are nicely browned. Eat hot topped with Greek yogurt or sour cream. Well, we had regular old Latkes today and the boys devoured a lot. Jonas had his with applesauce, Benny his with sour cream and I mine with catsup and we were all happy as clams. I’m eager to try a new version so will check the garden for parsnips tomorrow. these were delicious! i did turnip, sweet potato, and carrot. the housemates loved ’em. So glad they worked out for you Amie. The technique is a total go-to for me when i’m short on time and need something I know the kid (and everyone else!) will eat.